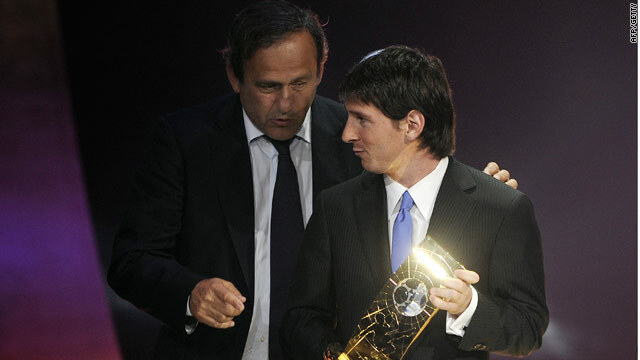 Messi exchanges a moment with Michel Platini after getting his award. (CNN) -- Barcelona star Lionel Messi was named FIFA World Player of the Year in Zurich on Monday, capping a remarkable 2009 for the Argentina star. Messi helped his club side Barcelona win a historic treble of Champions League, Spanish League and Spanish Cup and at the weekend scored the winner as the Catalan giants claimed the Club World Cup trophy. Messi, who claimed the top European honor, the Ballon d'Or, earlier this month, beat off the challenge of last year's winner Cristiano Ronaldo, Kaka of Real Madrid and fellow Barca stars Andres Iniesta and Xavi in the annual poll. The 22-year-old paid compliment to his teammates as he collected the award from FIFA president Sepp Blatter and his UEFA counterpart Michel Platini and said it was a "great honor." Messi added: "A magnificent year for Barcelona has ended in the best possible way for the club and for myself." The goalscoring winger struck in extra time as Barcelona beat Estudiantes of Argentina 2-1 on Saturday to win the Club World Cup final, the European champions' sixth trophy of the year. He also scored the clinching second in Barca's 2-0 win over title holders Manchester United to win the Champions League in May. Messi will be heading to next year's World Cup with Argentina after Diego Maradona's men scraped into the finals after struggling to qualify from South America. He had helped his country win the Olympic football gold in Beijing in 2008 and will be hoping for a revival in their fortunes in South Africa where he will look to showcase his formidable talents. Messi joined Barcelona from Newell's Old Boys which is based in Rosario, Argentina in 2000. In September he signed a two-year contract extension which will keep him at the club until 2016. Brazil's Marta was named women's World Player of the Year, at the glittering awards night in Switzerland, which was co-hosted by CNN World Sport's Pedro Pinto. Consolation for Ronaldo, who is now at Real Madrid, came as he picked up the FIFA Puskas award for the best goal of the 2008/09 season - his long-range effort for Manchester United against Porto in the Champions League in April.